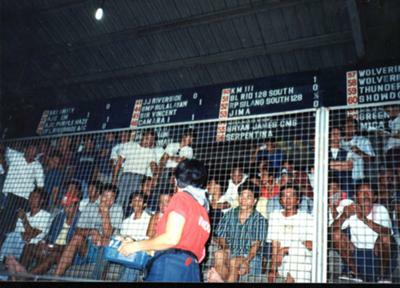 "BETTING FRENZY AT THE "Rolligon Cockpit" on 30-5-1995. I had been to Manila by ship in 1995 and visited the "Rolligon Cockpit" on 29/5/1995 as well as 30/5/1995 for the "Derby Fights". Happened to meet Mr Rolando.S.Luzong, the Rolligon Coliseum manager who allowed me to photograph the entire proceedings. I have written a blog on "Cockfights", both "LEGAL" and "ILLEGAL". its a blood sport, no doubt about that. Its exciting, its gambling no question about it, look at the sport it looks cruel for the animals. It may not be the kind of fun your looking for. Chickens do eventually end oneeen toup in the pot anyway you look at it. As gambling goes, the sport is way too slow for people looking for fast action gambling. its entertainment, but not the sort most people would go to have fun. If you have never been to one, you should and see for yourself. its perfect when you have nothing else to do.